Unless you live in or around the Phoenix area, you're unlikely to have gotten turned on to the heavy '70s jam grooves of a band that carries on the spirit of outfits like Uriah Heep, Wishbone Ash, Robin Trower, Savoy Brown and Humble Pie. 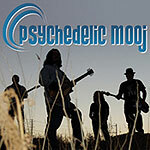 As with those legendary blues-based bands, the Mooj's magic begins with a solid but supple rhythm. Drummer Tracy Miranda-Binkley and bassist Hellhound Dave Hull create a foundation of such tremendous cohesion that guitarists Richard Chavez (rhythm) and Bill Tuli (lead, slide) can paint their thick, swirling musical fractals with complete confidence. Tuli pulls a rippling, muscular sound out of his axe, and his solos are nicely non-linear in their improvisation. While the band is stylistically much more in line with those offered as comparisons above, the chug-a-lug rhythm with razor-sharp guitar leads dancing over it reminds more than a little of Creedence. The songwriting is shared by all the members of the band, and most of the songs are as good as what we got from those great early '70s heavy blues combos: Long, meandering guitar solos, thick-as-a-bowl of Southwestern chili rhythms. The only real weakness is the lack of a strong singer in the band. Tuli is the best of them (Chavez and Hull also take turns), but he's competent at best. As Trower proved with his longtime singer James Dewar, you don't need Pavarotti on the mic to create great music, but you do need a singer whose confidence and chops are equal to what the members of the Mooj bring to their instruments.